The Admiral Nakhimov heavy cruiser is to receive new ordnance, putting it ahead of the Russian fleet’s current flagship, the Peter the Great missile cruiser. Military sources say the installation of the new long-range S-400 and Poliment-Redut anti-aircraft missile systems, part of the modernization of the Russian fleet, will not change the ship's combat missions. Russia’s Admiral Nakhimov nuclear cruiser is to receive the new long-range S-400 and the middle-range Poliment-Redut anti-missile systems, as well as Caliber cruise missiles, as part of the ongoing modernization of the fleet. According to Vladimir Spiridopoulo, director general of the Severnoye Design Bureau and developer of the cruiser project, after the modernization process the Admiral Nakhimov will be more powerful than its ‘sister ship’, the heavy nuclear missile cruiser Peter the Great, which is currently the Northern Fleet's flagship. Besides the Admiral Nakhimov, it is possible that another ship from the same project, the Admiral Lazarev, will also undergo similar modernization. The Admiral Lazarev, a component of the Pacific Ocean Fleet, is currently being serviced at a shipyard. 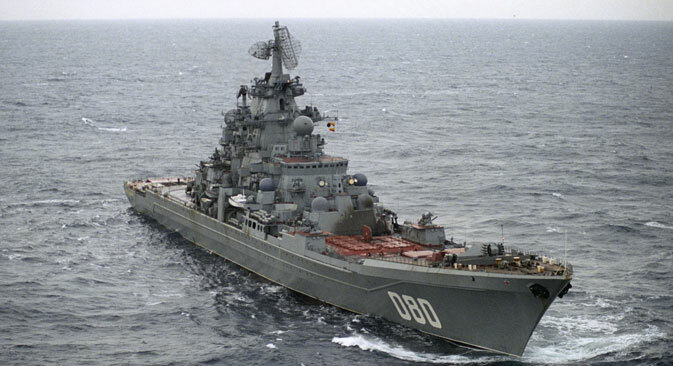 "Even before the beginning of the process, the Russian Navy was discussing what kind of ordnance to install on the Admiral Nakhimov," says independent military expert and editor-in-chief of the Militaryrussia internet project, Dmitry Kornev. "According to the announcements made at Navy Headquarters, they were even considering equipping the cruiser with the new S-500 anti-missile system." Kornev believes that the shipbuilders have preserved the cruiser's original weapons system, but upgraded it to modern requirements. "The S-400 will replace the S-300F, which was installed on the cruiser earlier, the Poliment-Redut will replace the Osa-M and the Caliber cruise missiles will replace the supersonic P-700 Granit anti-ship cruise missiles," notes Kornev, adding that with such weaponry the cruiser will surely be the most powerful ship in the Russian fleet. Whereas before, the supersonic P-700 Granit anti-ship cruise missiles installed on the Nakhimov were capable of hitting only overwater targets, now, after the installation of the new Calibers, “the cruiser will be able to strike not only overwater but also land targets, which will greatly increase its combat potential, without doubt," he says. The Caliber cruise missiles, developed by the Novator Design Bureau (part of the Almaz-Antey Corporation), are now being installed on the new 885 Yasen-class submarines and the Buyan-M small missile ships. According to official data, the cruise missiles are capable of hitting targets at a range of 300 kilometers (186 miles). Sources in the Russian media also say that soon the Calibers will be able to strike targets at a range of at least 1,000 kilometers. It is possible that these missiles will also be supersonic. "In the Soviet Navy the 1144 Orlan-class ships [the class to which the Admiral Nakhimov belongs - RBTH] were the leading ships of the so-called ‘Overwater Ship Groups’, says Dmitry Boltenkov, an independent military expert, military historian and author of books on the history of the Soviet Navy. "In peaceful times they were responsible for keeping NATO country fleets, especially the American one, under surveillance." According to Boltenkov, judging by the weapons systems that will be installed on the cruiser in the course of modernization, its missions are unlikely to change much. "At the same time, it is possible that with the installation of the new communications and automated control systems, the Nakhimov can easily become the squadron's flagship," says Boltenkov. For now the question still remains: What will the shipbuilders do with the complex Polin sonar system that is installed on all the 1144 Orlan ships? It is possible that Polin will undergo complete modernization or will be replaced with a fundamentally new sonar system. From 1980 to 1998 a total of four 1144 Orlan heavy nuclear missile cruisers were added to the Soviet and then the Russian Navy. The first of the series was the Kirov in 1980 and the last was the Peter the Great, which joined the fleet in the spring of 1998.